From Hanzi Smatter, again, a piece of red retail hitting the Western market and this one is really hip! 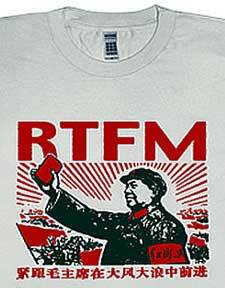 Mao is holding up his little red book and exhorting the geek-speak acronym for "Read the Effing Manual!" I had to take down the post on the skull purses with the silly commie logo in Chinese, because, well, they were just too ugly. I mean they were u-g-l-y. How ugly were they? Uglier than a two headed lamb. As we used to say on Compuserve, ROF,LMAO. (Showing my authentic claim to geekdom, there.) Ten points if you know that acronym.